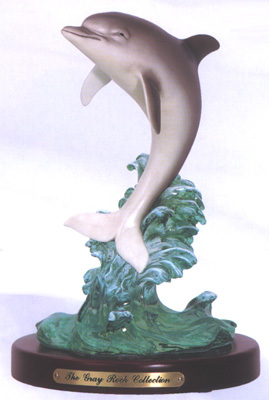 This beautiful Leaping Dolphin Figurine is individually hand crafted and hand painted with the finest materials. The perfect accent to your home or office and a great gift for the dolphin and ocean lover. This piece is of the finest detail to ensure "ART GALLERY QUALITY at BREAK THROUGH PRICES." 6.5" W. x 9" H.
finest poly resin on a wooden base.